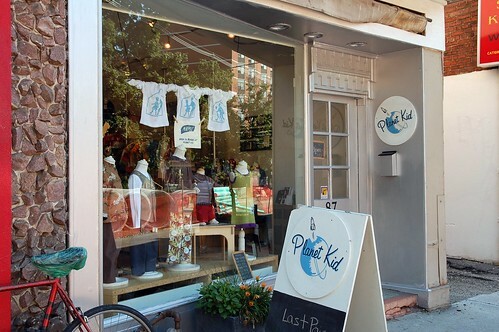 Tomorrow is the Kids Trunk Show! Although I’m not a parent, I imagine that trying to find interesting, engaging things to do with your child would be a real challenge if something like The Little Paper didn’t exist. Started by local mom, Vicki, The Little Paper organizes and lists activities, groups, events, classes and local business that are relevant to young urban families. It is an incredible resource that is passionate about family time. The Little Paper can be accessed in print version at locations all across the city or via their email newsletter, so you’ll always know what’s happening on any given day to delight your little ones and yourself. 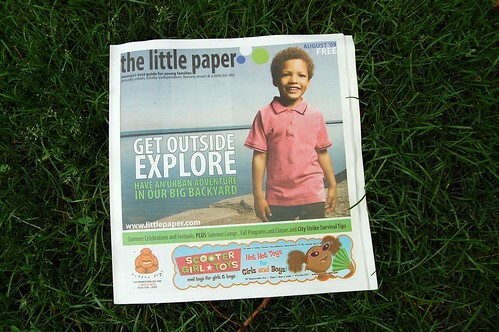 Pick up a free copy of The Little Paper tomorrow at the Kids Trunk Show! How and when did The Little Paper start? Vicki : The Little Paper began as a last ditch effort to avoid returning to work in an office. I’d been home with my daughter for two and a half years and had officially run out of money. I didn’t want to leave her and I couldn’t imagine going back to work as I had known it before she was born. So, when my dad gave me $2000 to put into our falling down house, I used it to start The Little Paper instead. Nobody had ever told me that magazines rarely survive and never make money so I just jumped in and worked really, really hard to build a great independent resource for city families. I had come of age reading Eye and Now but after I became a parent, I couldn’t find anything that spoke to me as an urban mother and I knew that there must be a lot of other parents in the city in the same position… people who wanted to live vibrantly in their communities, experience big and small culture with their children and who could really use a modern, relevant family guidebook to the city. The original tagline of the paper was “What Do You Want To Do Today?” It was pretty apt. We published 2000 copies of the first issue of The Little Paper in December 2003. It featured a grainy picture of my daughter Lily in High Park, 16 pages of 12 point type, 14 ads and an astonishing amount of information about events, activities, programs and classes for West End families. Gillian Anderson, whom I’d met about 3 weeks earlier at a drop-in, had keyed in all the listings and we put it all together on a four year old imac G3 and a borrowed copy of Quark. A little over five years (and a second daughter) later, we’re printing 10,000 copies of a month, run about 54 pages with 80 or so regular advertisers and have reduced the type size to 8. Most importantly, we’ve got almost a dozen moms working for us, carving out their own part-time jobs around the needs of their families and bringing extraordinary creativity, commitment and intelligence to each issue. Have you found that the focus or needs of your readers has changed since you began? Vicki : The one year maternity leave program started shortly before the paper began and has really helped families (and mothers in particular) spend time with their children and explore the resources in their city and their community. Making it easier for families to stay home for the first year creates a ripple effect of positive changes. When families have time to be together, they are better able to participate in their communities and this supports local business, safer neighbourhoods, greater resources and helps create strong relationships among neighbours. Another big change is the desire for greener alternatives. 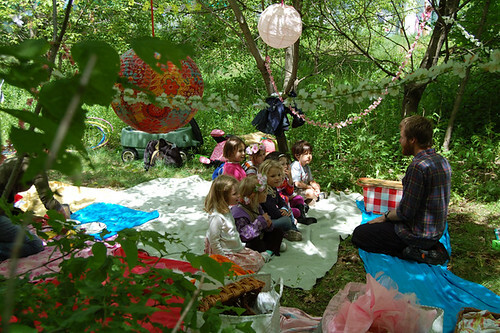 Having a child is a huge incentive to create a safer, cleaner, healthier planet and families are seeking out products, services and activities that celebrate and sustain the environment. Are there any new local groups or businesses that The Little Paper would like to share? Vicki : Absolutely! The filtered family beach at Sunnyside, breakfast sandwiches at Nicole’s Belly Catering in Parkdale, wonderful independent clothing at Sara’s Planet Kid on Roncey, Nature walks with Katie, Jon, Sara and Diana on Wednesday afternoons at The High Park Nature Centre and our friend Chris Reed will launch Small Print , a program of stories, music, crafts and sing a longs with independent Canadian authors and musicians, in October. With two young girls of your own, what activities/events are they interested in doing this summer? Vicki : Sewing has been huge in our house this summer. We found a brilliant old cotton sheet set covered with violets and made dresses, a skirt, a halter top, head scarves, stuffed animals, bags for carrying stuffed animals, little purses for stuffed animals to carry… it’s been really fun. We’ve also been spending a lot of time on Ward’s Island, swimming, canoeing, eating picnics. Probably the coolest thing we’ve done so far though was driving up to the old U of T observatory in Richmond Hill and staying up late to watch the Perseid Meteor shower. What is your earliest crafting memory as a child? Vicki : Its difficult to remember a time when we weren’t making something. I baked and sewed with my mom, made flower fairies and fairy villages in the woods at my grandparents cottage and spent the entire summer of 1970 finger-knitting. I think the memories I most cherish though, are those of the Saturday afternoon trips my dad and I made to the lakeshore. We drew pictures, climbed rocks and collected stones and driftwood, sea glass and feathers to make sculptures. He had a workroom in the garage that smelled of all the good smells… sawdust, gasoline, wood, paint, turpentine and glue and he was trusting and patient and generous with his tools and time and interest. He made me feel like the artist I was. Still does, actually.